Celeste Holm (April 29, 1917 – July 15, 2012) was an American stage, film and television actress. 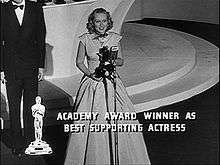 Holm won an Academy Award for her performance in Gentleman's Agreement (1947), and was Oscar nominated for her roles in Come to the Stable (1949) and All About Eve (1950). She originated the role of Ado Annie in the Rodgers and Hammerstein musical Oklahoma! (1943). Born and raised in Manhattan, Holm was an only child. Her mother, Jean Parke, was an American portrait artist and author; her father, Theodor Holm, was a Norwegian businessman whose company provided marine adjustment services for Lloyd's of London. Because of her parents' occupations, she traveled often during her youth and attended various schools in the Netherlands, France and the United States. She graduated from University School for Girls in Chicago, where she performed in many school stage productions. She then studied drama at the University of Chicago before becoming a stage actress in the late 1930s. Holm's first professional theatrical role was in a production of Hamlet starring Leslie Howard. She first appeared on Broadway in a small part in Gloriana (1938), a comedy which lasted for only five performances, but her first major part on Broadway was in William Saroyan's revival of The Time of Your Life (1940) as Mary L. with fellow newcomer Gene Kelly. The role that got her the most recognition from critics and audiences was as Ado Annie in the premiere production of Rodgers and Hammerstein's Oklahoma! in 1943. After she starred in the Broadway production of Bloomer Girl, 20th Century Fox signed Holm to a movie contract in 1946. She made her film debut that same year in Three Little Girls in Blue, making a startling entrance in a "Technicolor red" dress singing "Always a Lady," a belting Ado Annie-type song, although the character was different—a lady. In 1947 she won an Oscar and Golden Globe for Best Supporting Actress in Gentleman's Agreement. After another supporting role in All About Eve, however, Holm realized she preferred live theater to movie work, and only accepted a few select film roles over the next decade. The most successful of these were the comedy The Tender Trap (1955) and the musical High Society (1956), both of which co-starred Frank Sinatra. She starred as a professor-turned-reporter in New York City in the CBS television series Honestly, Celeste! (fall 1954) and was thereafter a panelist on Who Pays? (1959). She also appeared several times on ABC's The Pat Boone Chevy Showroom. 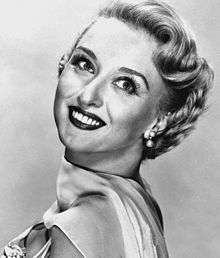 In 1958, she starred as a reporter in an unsold television pilot called The Celeste Holm Show, based on the book No Facilities for Women. Holm also starred in the musical The Utter Glory of Morrissey Hall. In 1965, she played the Fairy Godmother alongside Lesley Ann Warren in the CBS production of Cinderella. In 1970–71, she was featured on the NBC sitcom Nancy, with Renne Jarrett, John Fink and Robert F. Simon. In the story line, Holm played Abby Townsend, the press secretary of the First Lady of the United States and the chaperone of Jarrett's character, Nancy Smith, the President's daughter. During the 1970s and 1980s, Holm did more screen acting, with roles in films such as Tom Sawyer and Three Men and a Baby, and in television series (often as a guest star) such as Columbo, The Eleventh Hour, Archie Bunker's Place and Falcon Crest. In 1979, she played the role of First Lady Florence Harding in the television mini-series, Backstairs at the White House. She was a regular on the ABC soap opera Loving, appearing first in 1986 in the role of Lydia Woodhouse and again as Isabelle Dwyer Alden #2 from 1991 to 1992. She last appeared on television in the CBS television series Promised Land (1996–99). A life member of The Actors Studio, Holm received numerous honors during her lifetime, including the 1968 Sarah Siddons Award for distinguished achievement in Chicago theatre; she was appointed to the National Arts Council by then-President Ronald Reagan, appointed Knight, First Class of the Order of St. Olav by King Olav of Norway in 1979, and inducted into the American Theater Hall of Fame in 1992. She remained active for social causes as a spokesperson for UNICEF, and for occasional professional engagements. From 1995 she was Chairman of the Board of Arts Horizons, a not-for-profit arts-in-education organization. In 1995, Holm's was inducted into the Scandinavian-American Hall of Fame. In 2006, Holm was presented with a Lifetime Achievement Award by the SunDeis Film Festival at Brandeis University. Holm was a guest at the 2009 Mid-Atlantic Nostalgia Convention in Aberdeen, Maryland. Some of the movies in which she appeared were screened at the festival, and the un-aired television pilot for Meet Me in St. Louis was shown. She received an honorary award during the dinner banquet at the close of the event. Holm's first marriage was to Ralph Nelson in 1936. Their son, Internet pioneer and sociologist Ted Nelson (born 1937), was raised by his maternal grandparents. The marriage ended in 1939. In his 2010 memoir, Possiplex, her son, credited with coining the term "hypertext," described this and other choices as "entirely the right decisions." He reportedly did not name his mother in the book. Holm married Francis Emerson Harding Davies, an English auditor, on January 7, 1940. Davies was a Roman Catholic, and she was received into the Roman Catholic Church for the purposes of their 1940 wedding; the marriage was dissolved on May 8, 1945. From 1946 to 1952, Holm was married to airline public relations executive A. Schuyler Dunning, with whom she had a second son, businessman Daniel Dunning. From 1961 to 1996, she was married to actor Wesley Addy (1913–1996), until his death at age 83 in 1996. The couple lived together on her family farm in the Schooley's Mountain section of Washington Township, Morris County, New Jersey. On April 29, 2004, her 87th birthday, Holm married opera singer Frank Basile, age 41. The couple met in October 1999 at a fundraiser at which Basile was hired to sing. Soon after their marriage, Holm and Basile sued to overturn the irrevocable trust that was created in 2002 by Daniel Dunning, Holm's younger son. The trust was ostensibly set up to shelter Holm's financial assets from taxes though Basile contended the real purpose of the trust was to keep him away from her money. The lawsuit began a five-year battle with her sons, which cost millions of dollars, and according to an article in The New York Times, left Holm and her husband with a fragile hold on their apartment, which Holm purchased for $10,000 cash in 1953 from her film earnings, and which is now believed to be worth at least $10,000,000. According to her husband, Holm had been treated for memory loss since 2002, suffered skin cancer, bleeding ulcers and a collapsed lung, and had hip replacements and pacemakers. In June 2012, Holm was admitted to New York's Roosevelt Hospital with dehydration. She suffered a heart attack on July 13, 2012 in the facility. She died at her Central Park West apartment on July 15, 2012. She was survived by husband Frank Basile and her sons and grandchildren. 1950 All Star Revue Guest Actress Episode "1.6"
Margaret Best Episode: "The Pacing Goose"
1952 Schlitz Playhouse Episode: "Four's a Family"
Lux Video Theatre Katherine Case Episode: "The Bargain"
1953 Lux Video Theatre Miss Prynne Episode: "Lost Sunday"
Hollywood Opening Night Episode: "Mrs. Genius"
Your Jeweler's Showcase Episode: "Heart's Desire"
1955 United States Steel Hour, TheThe United States Steel Hour Madge Collins Episode: "The Bogey Man"
1956 Climax! Mary Miller Episode: "The Empty Room Blues"
Steve Allen Show, TheThe Steve Allen Show Mad Meggie Episode: "2.8"
Producers' Showcase Mad Meggie Episode: "Jack and the Beanstalk"
1957 Schlitz Playhouse Lettie Morgan Episode: "The Wedding Present"
Goodyear Playhouse Maggie Travis Episode: "The Princess Back Home"
Zane Grey Theater Sarah Kimball Episode: "Fugitive"
1960 Art Carney Special Episode: "The Man in the Dog Suit"
Christophers, TheThe Christophers Episode: "Women of the Bible"
1961 Play of the Week Virginia Episode: "A Clearing in the Woods"
1962 Follow the Sun Miss Bullfinch Episode: "The Irresistible Miss Bullfinch"
Checkmate Laraine Whitman Episode: "So Beats My Plastic Heart"
Alcoa Premiere Laura Bennett Episode: "Cry Out in Silence"
1963 Dr. Kildare Nurse Jane Munson Episode: "The Pack Rat and Prima Donna"
Burke's Law Helen Forsythe Episode: "Who Killed the Kind Doctor?" 1964 Eleventh Hour, TheThe Eleventh Hour Billie Hamilton Episode "How Do I Say I Love You?" 1965 Mr. Novak Rose Herrod Episode: "An Elephant Is Like a Tree"
Run for Your Life Margot Horst Episode: "The Cold, Cold War of Paul Bryan"
Fugitive, TheThe Fugitive Flo Hagerman Episode: "The Old Man Picked a Lemon"
1966 Long Hot Summer, TheThe Long Hot Summer Libby Rankin Episode: "Face of Fear"
1967 Fugitive, TheThe Fugitive Pearl Patton Episode: "Concrete Evidence"
F.B.I., TheThe F.B.I. Flo Clementi Episode: "The Executioners: Part 1"
Episode: "The Executioners: Part 2"
Insight Mrs. Berns Episode: "Fat Hands and a Diamond Ring"
1970 Name of the Game, TheThe Name of the Game Irene Comdon Episode: "The Brass Ring"
1972 Delphi Bureau, TheThe Delphi Bureau Sybil Van Loween Episode: "Pilot"
1973 Medical Center Dr. Linda Wilson Episode: "No Margin for Error"
1974 Medical Center Geraldine Stern Episode: "Web of Intrigue"
Streets of San Francisco, TheThe Streets of San Francisco Mrs. Shaninger Episode: "Crossfire"
Manhunter, TheThe Manhunter Episode: "The Truck Murders"
The Wonderful World of Disney Episode: "The Bluegrass Special"
Wonder Woman Dolly Tucker Episode: "I Do, I Do"
1978 Lucan Episode: "You Can't Have My Baby"
Fantasy Island Mabel Jarvis Episode: "The Beachcomber/The Last Whodunnit"
1979 Fantasy Island Sister Veronica Episode: "The Look Alikes/Winemaker"
Trapper John, M.D. Claudia Episode: "The Shattered Image"
Love Boat, TheThe Love Boat Estelle Castlewood Episode: "A Good and Faithful Servant/The Secret Life of Burl Smith/Tug of War/Designated Lover"
Archie Bunker's Place Estelle Harris Episode: "Growing Up is Hard to Do"
1982 American Playhouse Celebrity Episode: "The Shady Hill Kidnapping"
Trapper John, M.D. Lillie Townsend Episode: "Don't Rain on My Charade"
1983 Archie Bunker's Place Estelle Harris Episode: "Three Women"
Love Boat, TheThe Love Boat Florence Flanders Episode: "Buck Stops Here, The/For Better or Worse/Bet on It"
1985 Matt Houston Katherine Hershey Episode: "Company Secrets"
Magnum, P.I. Abigail Baldwin Episode: "The Love That Lies"
1988 Spenser: For Hire Rose Episode: "Haunting"
1989 CBS Summer Playhouse Samantha Orbison Episode: "Road Show"
1992 Cheers Grandmother Gaines Episode: "No Rest for the Woody"
1995 Great Performances Episode: "Talking With"
Touched by an Angel Hattie Greene Episode: "Promised Land"
1997 Touched by an Angel Hattie Greene Episode: "The Road Home: Part 1"
Episode: "Amazing Grace: Part 2"
1998 Touched by an Angel Hattie Greene Episode: "Vengeance Is Mine: Part 1"
2002 Third Watch Florence Episode: "Transformed"
2004 Whoopi Diana Episode: "The Squatters"
1 2 3 Anita Gates (July 15, 2012). "Celeste Holm, Witty Character Actress, Is Dead at 95". New York Times. Retrieved 2014-12-23. Celeste Holm, the New York-born actress who made an indelible Broadway impression as an amorous country girl in Rodgers and Hammerstein's "Oklahoma!," earned an Academy Award as the knowing voice of tolerance in "Gentleman's Agreement" and went on to a six-decade screen and stage career, frequently cast as the wistful or brittle sophisticate, died early Sunday at her apartment in Manhattan. She was 95. Her death was announced by Amy Phillips, a great-niece. Ms. Holm had a heart attack at Roosevelt Hospital in New York last week while being treated there for dehydration, but she was taken home on Friday. ↑ Garfield, David (1980). "Appendix: Life Members of The Actors Studio as of January 1980". A Player's Place: The Story of The Actors Studio. New York: MacMillan Publishing Co., Inc. p. 278. ISBN 0-02-542650-8. ↑ "Ridder av St. Olav", Aftenposten, morning edition 21. May 1979, p. 10. ↑ "SAHF Inductees". hostfest.com. Norsk Høstfest. Retrieved 11 January 2016. ↑ "SunDeis 2006". SunDeis Film Festival web site. Archived from the original on 2006-09-10. Retrieved 2007-10-29. 1 2 3 John Leland (July 2, 2011). "Love and Inheritance: A Family Feud". New York Times. Retrieved 2011-07-04. ↑ Staff writers (1952-05-12). "Births, deaths, marriages, divorces". Time. Retrieved 2008-05-15. ↑ via Associated Press. "Celeste Holm, Oscar-winning actress, dies at 95", Express-Times, July 15, 2012. Accessed October 22, 2015. "Celeste Holm married her fourth husband, actor Robert Wesley Addy, in 1966. The couple lived in Washington Township., Morris County, N.J."
↑ Summary of Preserved Farms - EG Jewett / Holm Farm, Morris County Agriculture Development Board, October 12, 2012. Accessed October 22, 2015. "Owned since 1922 by the family of actress Celeste Holm, this large farm atop Schooley's Mountain is in wheat and tree fruit production." ↑ Jones, Kenneth (2004-04-30). "December Bride: Shocking Guests, Celeste Holm Marries Beau at 85th Birthday Party". Playbill. ↑ "Oscar-Winning Actress Celeste Holm Dies At 95". Huffington Post. July 15, 2012. ↑ "Fire At Robert De Niro's NYC Apartment; No Injuries". Huffington Post. June 9, 2012. ↑ "Celeste Holm on Bob Crosby Show". Harrisburg Telegraph. January 26, 1946. p. 15. Retrieved May 7, 2015 – via Newspapers.com. ↑ "On The Air". The Gazette and Daily. March 2, 1950. p. 20. Retrieved May 8, 2015 – via Newspapers.com. ↑ "Dial Chatter". The La Crosse Tribune. May 11, 1952. p. 18. Retrieved May 8, 2015 – via Newspapers.com. ↑ "(radio listing)". The Decatur Daily Review. May 4, 1952. p. 50. Retrieved May 8, 2015 – via Newspapers.com. ↑ Kirby, Walter (November 15, 1953). "Better Radio Programs for the Week". The Decatur Daily Review. p. 50. Retrieved July 7, 2015 – via Newspapers.com. ↑ "CBS Radio Mystery Theater". Santa Ana Register. February 26, 1976. p. 19. Retrieved May 7, 2015 – via Newspapers.com. Wikimedia Commons has media related to Celeste Holm.